Maidenhead is a pleasant city on the Thames River. 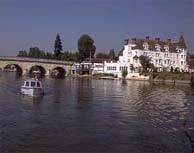 The town has ancient Roman ruins harkening back to a time long ago, but it didn�t have any real recent growth until there was a bridge built over the Thames, sometime before 1255. That was when Henry III decreed that the road be expanded, and hence Maidenhead became a through fare for travelers on their way to London or Bristol. Maidenhead underwent another change with the coming of the railroad. The commuter became more prominent and with Maidenhead in close proximity to London, it grew in size again. The town developed many inns, pubs, and restaurants for the service of the many travelers, so there is no shortage of places to get a meal or a drink.